Engine professionally serviced by Peter Wade December 2016. Next engine service booked for mid September 2018. This Swedish built semi-displacement cruiser is strong, seaworthy and ideal for family coastal, cross channel and European canal cruising. The safe and reliable hull with deep V bow built by Storebro and designed by Wilke & Wendlom is well proven. It is also used commercially by the police and the military. The twin turbo diesels and bronze 5 bladed shaft driven props allow her to cruise easily and economically at around 10 kts whilst, when needed, she has the ability to reach around 20 kts. The open plan living area is both practical and comfortable. The spacious cockpit and wheel house with double sliding patio doors give good all round visibility and provide the right environment for entertaining friends and family. Within the sheltered wheel house there’s a folding helm seat to Port and bench seat to Sbd that converts to twin bunks when required. The massive sun roof lets you see the blue sky and sun when you want to and easily closes to give protection from the rain and cold when you get caught out. Down below there's also plenty of room. In good condition for it’s age, there's plenty of light and headroom (approx 6ft). There’s a large seating area/dinette to port, which converts to a large double bed and a linear galley to Sbd with full cooker, fridge and plenty of storage. The seperate heads compartment has a sink and shower with hot and cold running water. Forward of the saloon, the cabin has two generous single berths and again has a light and open feel. On the forward deck, there is plenty of room, the stem head bow roller with electric windlass allows for automatic self stowing of the anchor. This can be controlled from the bow or helm position. 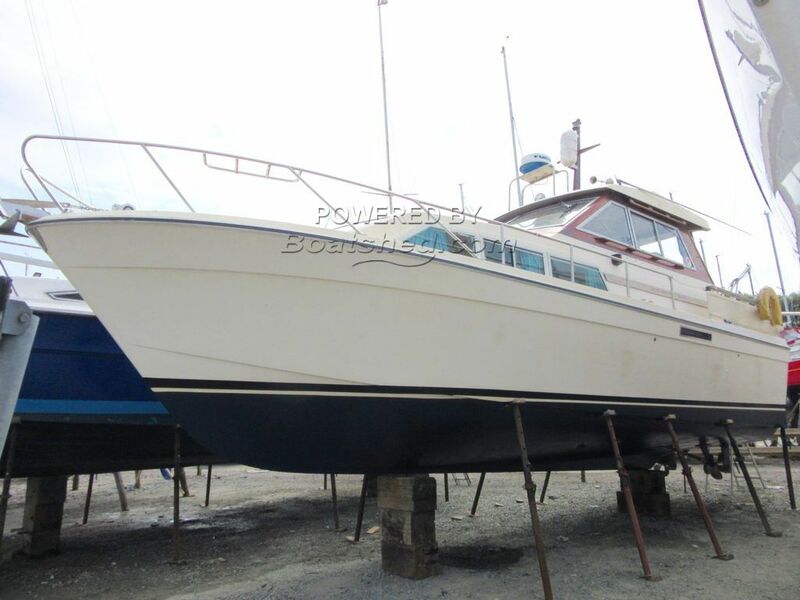 With great sea keeping qualities, plenty of space, a cockpit cover and twin engines to get you safely home, this is a quality family cruiser. This Storebro Biscay 31 has been personally photographed and viewed by Billy & Jo Hallam of Boatshed Plymouth. Click here for contact details.